For the former World Football League team, see Memphis Southmen. The Memphis Grizzlies are an American professional basketball team based in Memphis, Tennessee. The Grizzlies compete in the National Basketball Association (NBA) as a member team of the league's Western Conference Southwest Division. The Grizzlies play their home games at FedExForum. The team is owned by Robert Pera. 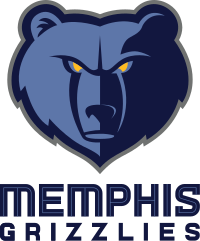 The Grizzlies are currently the only team in the major professional North American sports leagues based in the city of Memphis. The team was originally established as the Vancouver Grizzlies, an expansion team that joined the NBA for the 1995–96 season. 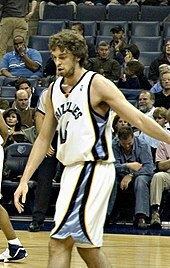 After the 2000–01 season concluded, the Grizzlies moved to Memphis. 1.5 2010–2019: "Grit and Grind"
The Vancouver Grizzlies applied to the NBA to relocate to Memphis on March 26, 2001, which was granted on July 3. As a result, the Grizzlies became the first major professional sports team from the "big four" major leagues to permanently play its home games in Memphis, as well as leaving the Toronto Raptors to be the only Canadian basketball team in the NBA. Memphis became the easternmost city in the Western Conference. In their first three seasons in Memphis, the Grizzlies played their home games at the Pyramid Arena. In the 2001 NBA draft, the Atlanta Hawks chose Pau Gasol as the third overall pick, who was traded to the Grizzlies. Forward Shane Battier was selected with the sixth pick in the same draft by the Vancouver Grizzlies. They also acquired Jason Williams from the Sacramento Kings in exchange for Mike Bibby that same year. 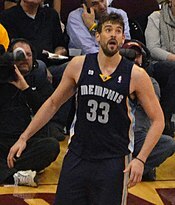 After the Grizzlies' first season in Memphis, Gasol won the NBA Rookie of the Year Award. However, despite the strong draft class, general manager Billy Knight was let go. After Knight's departure and the season, the team hired former Los Angeles Laker and Hall of Famer Jerry West as general manager in 2002, who later received the 2003–04 NBA Executive of the Year Award. After West's arrival the team was changed a great deal from Knight's team, with the removal of Sidney Lowe as head coach after 0–8 start to the season and a great deal of player movement, with players such as Mike Miller and James Posey becoming vital to the team's success. During the 2002–03 season, Hubie Brown was hired to coach the Grizzlies. Brown won the NBA Coach of the Year Award during the next season when the Grizzlies made the NBA playoffs for the first time in team history in 2004 as the sixth seed in the Western Conference in a drastic change from being perennially one of the worst teams in the NBA. They also won a then record 50 games under Gasol and Williams. In the playoffs they faced the San Antonio Spurs, who swept them out of the playoffs in four games. Brown stepped down as head coach during the 2004–05 season. At the time of his resignation, the Grizzlies had a losing record but West hired TNT analyst and former coach Mike Fratello to replace Brown. The Grizzlies' record improved and the team advanced to the postseason for the second consecutive season. However, the Grizzlies were swept out in the first round again, this time by the Phoenix Suns. After the season, which ended with anger between Fratello and many of the players, namely Bonzi Wells and Jason Williams, the team had an active 2005 off-season in which they revamped the team and added veterans. While the Grizzlies lost Wells, Williams, Stromile Swift, and James Posey, they acquired Damon Stoudamire, Bobby Jackson, Hakim Warrick, and Eddie Jones. They made the playoffs for the third consecutive year as well. With their record they had the fifth seed in the Western Conference playoffs and would face the Dallas Mavericks, who swept the Grizzlies in four games. Following the 2006 NBA draft, Jerry West traded Shane Battier to the Houston Rockets for their first round pick Rudy Gay and Stromile Swift. Before the 2006–07 season, they suffered a blow when Gasol broke his left foot while playing for Spain in the World Championships. The Grizzlies started the season 5–17 without Gasol, and then went 1–7 while he was limited to about 25 minutes per game. At that point, Fratello was fired and replaced by Tony Barone, Sr. as interim coach. Barone was the team's player personnel director and had never coached an NBA game though he had coached at the collegiate level for both Creighton and Texas A&M being named coach of the year in their conferences three times during his tenure. The Grizzlies finished the 2006–07 season with a league-worst 22–60 record, and Jerry West announced his resignation from his position as the team's general manager shortly after the end of the regular season. The team also hired Marc Iavaroni, who was previously with the Phoenix Suns as an assistant coach, to be the team's new head coach. Despite the last-place finish, the Grizzlies, who held the best chance of landing the first pick, ended up with the fourth pick in the 2007 NBA draft, with which the Grizzlies selected Mike Conley, Jr.
On June 18, 2007, the Grizzlies named former Boston Celtics general manager Chris Wallace as the team's general manager and vice president of basketball operations, replacing the retired West. A few days later, they hired former Philadelphia 76ers and Orlando Magic head coach Johnny Davis, longtime NBA assistant coach Gordon Chiesa, and the head coach of the 2007 NBA Development League champion Dakota Wizards, David Joerger, as the team's new assistant coaches. Gene Bartow was named the Grizzlies' president of basketball operations on August 16, 2007. On February 1, 2008, Pau Gasol was traded to the Los Angeles Lakers for Kwame Brown, Javaris Crittenton, Aaron McKie, rights to Marc Gasol (Pau's younger brother), and 2008 and 2010 first-round draft picks. On January 22, 2009, head coach Marc Iavaroni was fired and replaced on an interim basis by assistant coach Johnny Davis for two games. Lionel Hollins was named the Grizzlies' permanent head coach on January 25, 2009. On June 25, 2009, with the second overall pick in the NBA draft, Memphis selected Hasheem Thabeet, then selected DeMarre Carroll with the 27th overall pick. On September 9, 2009, the Grizzlies signed free agent Allen Iverson to a one-year, $3.5 million deal. He only played three games (none in Memphis) before he left for "personal problems". He was then waived by the Grizzlies. Following Iverson's departure, the Grizzlies improved. With new acquisition Zach Randolph playing at an All-Star level, Marc Gasol's improvement, and a commitment to defense, the Grizzlies were in playoff contention for much of the 2009–10 season, before finishing 10th in the Western Conference with a win-loss record of 40–42. Going into the 2010–11 season the Grizzlies celebrated the tenth year of basketball in Memphis. The season started with tremendous enthusiasm by the fan base in the Memphis area. Although the Grizzlies and their fans were celebrating the tenth season, the Grizzlies were also cheering for the eighth spot in the Western Conference Playoffs. They finished with a 46–36 record. The Grizzlies found their way back into the post-season for the first time in five years in the 2010–11 season after a 101–96 home victory over the Sacramento Kings on April 8, 2011. While in the playoff hunt in February 2011, the Grizzlies traded Hasheem Thabeet, DeMarre Carroll, and a protected future first-round pick to the Houston Rockets for Shane Battier, and Ishmael Smith. The team became known locally and nationally for its "Grit and Grind"-style of basketball which means disruptive defense through high pressure on the ball (they were the team with the most steals per game in 2010–11) and their inside-out offense (they were the highest scoring team in the paint also). The Grizzlies achieved several firsts in franchise history during the 2011 NBA Playoffs. Entering the playoffs as an eighth seed, the team won their first playoff game in franchise history on April 17, 2011 with a 101–98 victory on the road against the top seeded San Antonio Spurs. Memphis then won their first home playoff game when they beat the Spurs 91–88 on April 23, 2011. Finally, on April 29, the team won their first playoff series when they beat the Spurs in game 6, 99–91 to win the series 4–2. This was only the fourth time in NBA history that an 8 seed defeated a 1 seed, and only the second time in a best-of-seven series (the first two were in a best-of-five series). The Grizzlies' historic season came to an end after the Oklahoma City Thunder defeated them in game 7 of the Western Conference Semifinals. The team re-signed Marc Gasol, and Hamed Haddadi after the 2010–11 season. The Grizzlies found their way back into the post-season for the second time in six years in the 2011–12 season after a 103–91 home victory over the New Orleans Hornets on April 18, 2012. They finished the 2011–12 season with a 41–25 record, fourth in the Western Conference. However, they were eliminated in the first round by the Los Angeles Clippers in seven games. During the 2012 off-season, the Grizzlies drafted Tony Wroten with the 25th overall pick. Their biggest signing in effort to improve their bench was bringing in Jerryd Bayless. They also acquired Wayne Ellington from the Minnesota Timberwolves in exchange for Dante Cunningham. On June 11, 2012, Michael Heisley reportedly had an agreement in principle to sell the Memphis Grizzlies to communications technology magnate Robert J. Pera, who at 34 had a spot on Forbes' 2012 list of the 10 youngest billionaires in the world. The purchase price was in the $350 million range. On August 23, 2012, Pera reached an agreement with a group of local partners including J.R. "Pitt" Hyde, Staley Cates, Ed Dobbs, Duncan Williams and Billy Orgel. On October 25, 2012, Robert Pera was officially approved as the owner of the Memphis Grizzlies. On November 4, 2012, Pera named Jason Levien the Chief Executive Officer and Managing Partner of the Memphis Grizzlies. On December 13, 2012, ESPN announced that John Hollinger was hired by the Grizzlies as their new vice president of basketball operations. On January 23, 2013, the Grizzlies acquired Jon Leuer from the Cleveland Cavaliers in exchange for Marreese Speights, Wayne Ellington, Josh Selby, and a future first-round pick. On January 30, 2013, the Grizzlies traded Rudy Gay and Hamed Haddadi to the Toronto Raptors in a three team deal also involving the Detroit Pistons. The Grizzlies acquired Tayshaun Prince and Austin Daye from the Pistons and Ed Davis and a future second-round pick from the Raptors. At the end of the season, Memphis finished with their best franchise record of 56–26, second in the division and as the fifth seed in the playoffs. Also, Marc Gasol was NBA Defensive Player of the Year. In the opening round, Memphis defeated the Los Angeles Clippers in six games after trailing in the series 0–2. This avenged their defeat from the previous year at the hands of the Clippers. Memphis then went on to the Western Conference Finals for the first time in franchise history when they defeated the Oklahoma City Thunder 4–1 in their semi-finals series. This was a rematch of their meeting in the 2011 NBA Playoffs, which the Thunder won in seven games. However, the Grizzlies' season ended in the conference finals as they were swept by the eventual conference champions, San Antonio Spurs in yet another rematch/reversal from the 2011 NBA Playoffs. The Grizzlies struggled to begin the 2013–14 season, starting out at 14–18 with Marc Gasol out, and entered the All-Star break with a win-loss record of 29–23. They went 21–9 after, finishing in third place in the Southwest division and in seventh place in the Western Conference with a win-loss record of 50–32, including a 14-game winning streak at FedExForum. They faced the Oklahoma City Thunder in the playoffs and had a record four straight overtimes from games 2–5, going 3–1 in the overtimes. The Grizzlies fell 4–3, despite an effort by Gasol in game 7 without Randolph after he was suspended for punching Thunder center Steven Adams in game 6. On October 29, 2014, the Grizzlies defeated the Minnesota Timberwolves 105–101 for the franchise's first victory in a season opener since 2000, the year before the team moved to Memphis. In the 2014–15 season, the Grizzlies made the NBA playoffs as the fifth seed in the Western Conference. In the first round, the Grizzlies defeated the Portland Trail Blazers in five games. Games 4 and 5 were played without Mike Conley, who in Game 3 suffered multiple facial fractures in a collision with Blazers guard C. J. McCollum. In the second round, they found themselves facing off against the top seeded Golden State Warriors and MVP Stephen Curry. The Warriors took Game 1, and Conley returned in Game 2 to lead the Grizzlies to a 108–95 victory. Memphis took a 2–1 series lead before Golden State ultimately dispatched the Grizzlies in six games. On April 1, 2016, the Grizzlies signed their 28th player for the season, an NBA record. On July 6, 2017, the team's management announced that Randolph's number 50 jersey would be retired in the future after he became a free agent, and eventually signed with the Sacramento Kings. During the 2018–19 season's trade deadline, the Grizzlies traded Marc Gasol to the Toronto Raptors in exchange for Jonas Valančiūnas, Delon Wright, C. J. Miles, and a 2024 second-round draft pick. The Grizzlies hold the draft rights to the following unsigned draft picks who have been playing outside the NBA. A drafted player, either an international draftee or a college draftee who is not signed by the team that drafted him, is allowed to sign with any non-NBA teams. In this case, the team retains the player's draft rights in the NBA until one year after the player's contract with the non-NBA team ends. This list includes draft rights that were acquired from trades with other teams. The Grizzlies have yet to formally retire a number, but have announced plans to retire their first number at an as-yet-undetermined time. After the Grizzlies released Zach Randolph during the 2017 off-season, the team announced that the no. 50 that Randolph wore from 2010 to 2017 would be retired. Just before the 2017–18 season, the team also announced that Tony Allen's no. 9 jersey would also be retired following his signing with the New Orleans Pelicans. After trading Marc Gasol during the 2018–19 season's trade deadline, the team announced that Gasol's no. 33 would be retired. The Grizzlies appear on television on the cable channel Fox Sports Southeast, owned and operated by Fox Sports Networks as a sister station to Fox Sports Tennessee. The TV broadcast crew is play-by-play announcer Pete Pranica, analysts Brevin Knight or Sean Tuohy, and sideline reporter Rob Fischer. On radio, the Grizzlies are heard on their flagship station WMFS-FM "ESPN 92.9". The radio broadcast crew is play-by-play announcer Eric Hasseltine, and analysts Hank McDowell and Elliot Perry. Grizz is the official mascot of the Memphis Grizzlies. He was first introduced in 1995 when the team was in Vancouver, British Columbia. Grizz was named 2011 NBA Mascot of the Year. In 2007, the performer playing Grizz was diagnosed with cancer. As a show of support, the Grizzlies chose not to have Grizz appear until he recovered. During this period, mascots from other teams performed at Grizzlies home games in Grizz's place. The franchise also launched a program called "Friends of Grizz", with donations and proceedings going to St. Jude Children's Research Hospital. Despite being one of the youngest squads in the NBA, the Grizzlies are rivals with the Los Angeles Clippers. The Grizzlies and Clippers have been rivals since the 2011–12 season, when the Clippers eliminated the Grizzlies in seven games in the first round of the 2012 NBA Playoffs. The Grizzlies returned the favor in the 2012–13 season, eliminating the Clippers in six games in the first round of the 2013 NBA Playoffs. There have also been violent scuffles between the players, mainly between the Grizzlies Zach Randolph and the Clippers Blake Griffin. The Grizzlies are also the first team to draw an ejection on Clippers guard Chris Paul after he elbowed Marc Gasol in the ribs in the closing minutes of Game 6. When asked about a rivalry with the Los Angeles Lakers, Clippers center DeAndre Jordan stated, "I don't think it'll ever be a rivalry. You guys [in the media] want it to be, though. I would say Memphis more than the Lakers. I hate every other NBA team in the league. If anybody [is our rival], I'd say Memphis." Although the two teams never met in the 2014 playoffs, they still engaged in close, heated matchups in the 2014–15 season. In a Grizzlies home game against the Clippers, the crowd was given flip-flop sandals designating Clippers players as "floppers". The Grizzlies also have a rivalry brewing with the Oklahoma City Thunder. The two squads have faced each other in the playoffs in 2011, 2013, and 2014. The Thunder beat the Grizzlies in the conference semifinals in 2011 and in the conference quarterfinals in 2014. Each of those two series went to seven games. The Grizzlies handled the Thunder in five games during the conference semifinals in 2013 before getting beat by the San Antonio Spurs in the conference finals that same year. The Grizzlies rivalry with the San Antonio Spurs goes way back in 2004 when the Spurs swept the Grizzlies in the first round. Seven years later, they would meet again in the 2011 NBA Playoffs. The Grizzlies upset the Spurs in six games, which made it the fourth time ever an 8th seed beat a first seed in the playoffs. They would then meet again in the conference finals in 2013, where the Spurs once again swept the Grizzlies to go to the NBA Finals and got swept again in 2016, due to a lot of injuries the Grizzlies had during the season. They met again the following year, where the Grizzlies lost in six games. ^ "NBA.com/Stats–Memphis Grizzlies seasons". National Basketball Association. Retrieved January 29, 2017. ^ "Connecting Memphis". Grizzlies.com. NBA Media Ventures, LLC. August 2, 2018. Retrieved August 3, 2018. ^ "Grizzlies Logo & Uniform" (PDF). 2018–19 Memphis Grizzlies Media Guide. NBA Media Ventures, LLC. October 12, 2018. Retrieved October 18, 2018. ^ "Memphis Grizzlies Reproduction and Usage Guideline Sheet". NBA Properties, Inc. Retrieved June 27, 2018. ^ "Memphis Grizzlies unveil reimagined brand identity system and newly designed uniforms". Grizzlies.com. NBA Media Ventures, LLC. August 2, 2018. Retrieved August 3, 2018. ^ "Memphis Grizzlies unveil new uniforms with FedEx as jersey sponsor". NBA.com. NBA Media Ventures, LLC. Associated Press. August 2, 2018. Retrieved August 3, 2018. ^ a b "Memphis Grizzlies announce restructuring of basketball operations department". NBA.com. April 11, 2019. Retrieved April 11, 2019. ^ "Memphis Grizzlies and FedExForum Directory". NBA.com. NBA Media Ventures, LLC. Retrieved April 4, 2016. ^ Herrington, Chris (November 8, 2012). "Grizzlies Ownership Group Breakdown". Memphis Flyer. Retrieved April 4, 2016. ^ Springer, Shira (June 19, 2007). "GM Wallace joins Grizzlies". The Boston Globe. Retrieved November 22, 2007. ^ "Grizzlies name Gene Bartow President of Hoops LP". NBA.com. NBA Media Ventures, LLC. August 16, 2007. Retrieved November 22, 2007. ^ "In dire need of frontcourt help, Lakers acquire Gasol from Grizzlies". ESPN.com. February 3, 2008. Retrieved May 7, 2015. ^ "Gasol dealt to Lakers in blockbuster trade". NBA.com/Lakers. NBA Media Ventures, LLC. February 1, 2008. Retrieved February 2, 2008. ^ Tillery, Ronald (January 25, 2009). "Grizzlies introduce Lionel Hollins as new coach". The Commercial Appeal. Retrieved January 26, 2009. ^ Aldridge, David (November 17, 2009). "Iverson, Grizzlies part ways after tumultuous start". NBA.com. NBA Media Ventures, LLC. Retrieved May 7, 2015. ^ "Allen Iverson, Memphis Grizzlies agree to terminate contract". ESPN.com. November 17, 2009. Retrieved May 7, 2015. ^ "Randolph, Conley lead Grizzlies past Kings 101–96". Yahoo! Sports. Associated Press. April 9, 2011. Retrieved April 9, 2011. ^ "Grizzlies pull away from top-seeded Spurs to seize 3–1 series lead". ESPN. Associated Press. April 26, 2011. Retrieved April 26, 2011. ^ "Grizzlies hold on, win series 4–2 to stun top-seeded Spurs". ESPN. April 30, 2011. Retrieved April 30, 2011. ^ "Thunder oust Grizzlies as Kevin Durant answers bell with 39-point Game 7". ESPN. May 16, 2011. Retrieved May 16, 2011. ^ "HoopsHype – NBA Salaries – Memphis Grizzlies". USA Today Sports. April 28, 2015. Retrieved May 7, 2015. ^ Solomon, Brian. "No. 10: Robert Pera – In Photos: Youngest Billionaires in the World – Forbes". Forbes. ^ "Heisley agrees to sell Grizzlies to billionaire Pera". NBA Media Ventures, LLC. Associated Press. June 11, 2012. Archived from the original on June 15, 2012. Retrieved June 11, 2012. ^ Stein, Marc (June 11, 2012). "Deal for Grizzlies reached". ESPN. Retrieved June 11, 2012. ^ "Grizzlies sale to Robert Pera approved by NBA Board of Governors". NBA.com. NBA Media Ventures, LLC. October 25, 2012. Retrieved May 7, 2015. ^ Windhorst, Brian (October 25, 2012). "Owners approve sale of Grizzlies". ESPN. Retrieved November 7, 2012. ^ "Grizzlies name Jason Levien Chief Executive Officer and Managing Partner". NBA.com. NBA Media Ventures, LLC. November 4, 2012. Retrieved November 7, 2012. ^ "Grizzlies trade Marreese Speights, Josh Selby to Cavaliers". 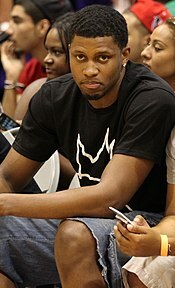 ^ "Grizzlies trade Rudy Gay to Raptors in three-team deal with Pistons". ^ Bailey, Clay (October 30, 2014). "Gasol powers Memphis past Minnesota 105-101". National Basketball Association. Retrieved May 7, 2015. ^ "And you are? Griz to set mark with 28th player". ESPN.com. Retrieved April 1, 2016. ^ "Open Letter to Z-Bo & Grizz Nation". NBA.com. NBA Media Ventures, LLC. July 6, 2017. Retrieved July 11, 2017. ^ "Kings Sign Zach Randolph". NBA.com/Kings. NBA Media Ventures, LLC. July 10, 2017. Retrieved July 11, 2017. ^ "Memphis Grizzlies acquire Jonas Valanciunas, Delon Wright, C.J. Miles and 2024 second round draft pick from Toronto Raptors". NBA.com. February 8, 2019. Retrieved February 9, 2019. ^ "Grizzlies select Wade Baldwin IV in First Round of 2016 NBA Draft". NBA.com. NBA Media Ventures, LLC. June 24, 2016. Retrieved September 24, 2016. ^ "Memphis Grizzlies complete trade with Orlando Magic". NBA.com. July 23, 2018. Retrieved July 24, 2018. ^ "Memphis Grizzlies to retire Zach Randolph's No. 50 jersey". NBA.com. NBA Media Ventures, LLC. July 8, 2017. Retrieved July 31, 2017. ^ "Memphis Grizzlies to retire Tony Allen's No. 9 jersey". NBA.com. NBA Media Ventures, LLC. October 12, 2017. Retrieved October 13, 2017. ^ "Memphis Grizzlies release statement on Marc Gasol from controlling owner Robert Pera". NBA.com. February 8, 2019. Retrieved February 9, 2019. ^ "About Grizz". NBA.com. NBA Media Ventures, LLC. May 7, 2015. Retrieved May 7, 2015. ^ "Memphis' 'Grizz' named 2011 NBA Mascot of the Year". The Commercial Appeal. August 31, 2011. Retrieved May 7, 2015. ^ "NBA Mascot of the Year: 'Grizz' of the Memphis Grizzlies". SLAM Online. September 1, 2011. Retrieved October 4, 2012. ^ "Return of the Grizz". Yahoo Sports. Retrieved June 22, 2017. ^ Devine, Dan. "Zach Randolph, Blake Griffin wrestle, Chris Paul ejected as Grizzlies oust Clippers". ^ Turner, Broderick (October 28, 2013). "DeAndre Jordan says Clippers-Lakers isn't a rivalry". Los Angeles Times. Retrieved October 29, 2013.